SYRACUSE, New York -- John Gillon hit a 3-pointer from the top of the key at the buzzer, and Syracuse upset No. 10 Duke 78-75 on Wednesday night as the Orange kept alive their postseason hopes. With just 7.5 seconds left on the clock after a Duke miss, Gillon drove to the top of the key and banked in a desperation shot to send the huge crowd into a frenzy as they stormed the court. Syracuse (17-12, 9-7 Atlantic Coast Conference) had lost three straight and needed another signature victory to go with its two top-10 wins to bolster its resume for a berth in the NCAA Tournament. The Orange have two games remaining, at Louisville on Sunday and at home to Georgia Tech on March 4. Duke (22-6, 10-5 ACC) had won seven straight and entered the game tied for second in the ACC with Louisville, a game behind North Carolina, which hosted the Cardinals later Wednesday night. Gillon finished with 26 points and Tyus Battle had 18 for Syracuse in a game that featured 11 ties, half of them in the closing minutes. Luke Kennard led Duke with 23 points, Jayson Tatum had 19 points and 13 rebounds for his second double-double of the season. They combined for 11 of Duke's 16 assists. Grayson Allen finished with eight points. The crowd of 30,331 began chanting "Let's Go Orange!" as soon as Syracuse coach Jim Boeheim greeted Duke coach Mike Krzyzewski before the opening tip. 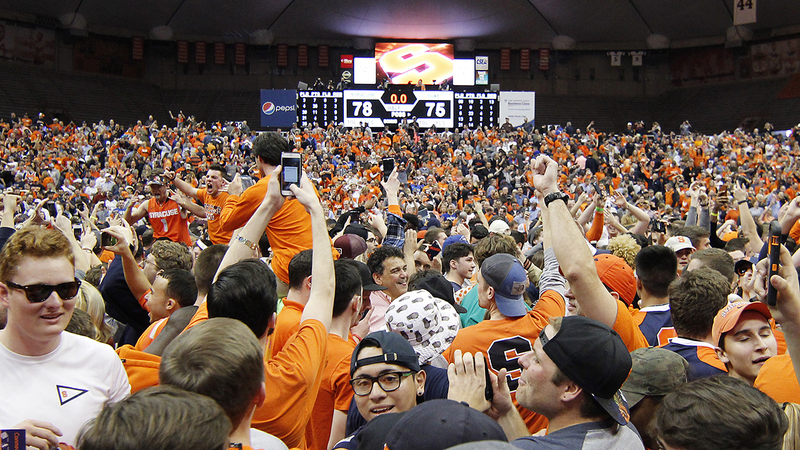 And when Battle scored eight points in just over 2 minutes to key an Orange rally that tied it at 47, the Carrier Dome was rocking like yesteryear as the Orange hit 9 of their first 11 shots. The Orange gained a two-point lead on two free throws from Gillon as both teams began trading shots. Tatum's 3 from the right corner was answered by one from Gillon that knotted the score at 54 midway through the half. Syracuse then took advantage of the double-bonus, hitting seven straight free throws sandwiched around Kennard's fifth 3-pointer of the game to gain a 61-59 lead. The game was tied six times in the final 10:12 and the Blue Devils were keyed by Amile Jefferson. Held scoreless in the first half, he scored nine straight points and finished with 14. Trailing by eight at the break, Syracuse moved within 37-35 in the first 3 minutes of the second half, sparked by Tyler Lydon's 3-pointer and Gillon's three-point play, and it was close the rest of the game. Kennard has made at least one 3-pointer in an ACC-best 31 straight games and entered the game shooting 48.5 percent from deep in league play. Jefferson needs eight points to become the ninth Duke player under Krzyzewski to notch 1,000 points and 850 rebounds. The game, which featured two of the top three winningest coaches in Division 1 history - Krzyzewski (1,065) and Boeheim (901) - attracted the largest on-campus college basketball crowd this season. It was the 81st crowd to surpass 30,000 in Carrier Dome history, first in two years, and first for a weeknight game since 1990. Duke had played Syracuse in the dome twice, both on Saturdays, and both drew 35,446, a dome record. Duke is at Miami on Saturday. Syracuse travels to No. 7 Louisville on Sunday.